Like many of her loyal fans, I was sad when hotshot trainer Terri Walsh packed up her New York City studio and moved her home to Costa Rica, and her business to the internet (subscribers pay $18.99 per month to stream unlimited classes). I missed her in-person energy. And then I kind of fell off the fitness wagon, and the excesses and indulgences of my life as a travel writer were starting to catch up with me. 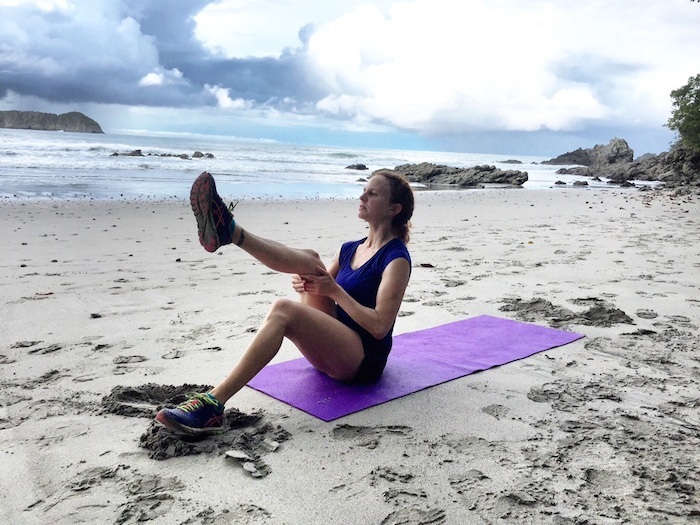 So when she invited me to the be the first guest for her private, super-luxury, completely customized fitness retreat—The Art of You—in Manuel Antonio, I jumped at the chance. It sounded divine, if difficult—seven nights to myself in a beautiful Balinese villa run by effortlessly charming men who both happen to be massage therapists and great cooks, plus fresh healthy food, and many hours of hard, heavy-weight workouts. 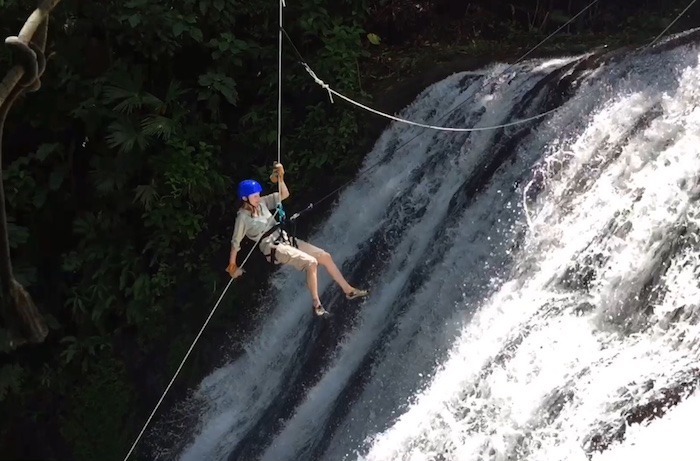 Oh, and beaches and rain forests and monkeys. It’s a package she’s charging $15,000 for, an amount that doubles what even the most swanky spas in North America do. But Terri has promised tons of attention and habit-changing advice. And I’d put money on her ability to deliver. Sunday: Terri is on the tarmac in Quepos, with Mark Goldstein, who owns the villa with partner Jon Harper, to greet me. They give me the itinerary they’ve spent two weeks preparing, putting thought into every detail down to how much rice I should get with which lunch. In her purple sneakers, short yoga shorts, and hot-pink tank top, she looks like a high school cheerleader. I’d say I’d like to look like her when I’m her age (she’s 52), but in fact I want to look like her now. I find this inspiring, not intimidating: I’m going to work hard this week in order to get closer. When she takes my measurements, I’m alarmed—I knew I’d let things slide but hadn’t known it was that bad. I double my resolve. Monday: The sun wakes me up at 5:30 a.m., and Mark comes by with a plate of fruit and a smoothie made with moringa, protein-packed kamut, and turmeric that he just picked on his property. The early to bed, early to rise thing is much easier here than in New York. (I realize I should work harder on the first half of that equation at home.) Today, I have four body-weight workouts in Terri’s Active Resistance Training (ART) Method—at 6:30 a.m. on the beach (interval runs) and then at 8:30 a.m., 11:30 a.m., and 4:00 p.m. on the yoga deck. I hate running intervals on the beach as much as I do anywhere else, and am relieved that the rest of the day will be non-impact. Terri designed the ART Method to be injury-preventive and to focus on aligning and engaging the feet, navel, ribs, and shoulders at all times. (This doesn’t mean it’s mellow: Step quickly from a plank into a one-legged standing balance 20 times and see how fast your heart is racing.) She’s also fond of compound exercises, twisting, and circular motions, which makes the workout mentally engaging. I like that I’m thinking, not just zoning out. Tuesday: Terri’s schedule has me alternating between workout days and hike days. I find the hiking days much easier (perhaps because I love hiking so much that I don’t notice my discomfort). Mark comes along as we walk several miles up a hill to a waterfall, which he and I rappel down. I’ve done this before, and I’m an adventure junkie, but this waterfall is 150 feet high and it’s the end of rainy season, so it’s huge. I find the outer limit of my comfort zone. (When I half-jokingly ask Terri if adrenaline burns calories, she thinks for a moment and says, yes, it probably does.) Terri, who is my fitness superhero, skips the rappelling. Heights are her kryptonite. Afterward, she and Mark go for a swim, and I sit on a rock in the sun—cold water is my kryptonite—and marvel at how relaxed I feel. A massage back at the villa (which I’ll get from Mark or Jon on all the hiking days) seals the deal. Wednesday: Another ART day, and now it’s getting heavy: 20-pound weights and kettlebells,a 12-bound Ugi ball (a squishier medicine ball) and a horrible 20-pound vest that she makes me wear for lunges and squats. When we play round after round of catch with the Ugi ball, and she keeps backing away from me, I get frustrated. “Use that,” she says. “Get angry. Hit me with the ball.” After the session, we have a long talk about women and anger—how we should express it and use it. If something isn’t working, fight harder to fix it. Fight harder to make yourself better. (Terri wrote the 1997 best-seller Diva: The Fitness System to Unleash Your Female Power.) As someone who can’t stomach the “affirmations” (AKA platitudes) that pervade today’s fitness scene, I like thinking of anger as a constructive approach. It’s definitely motivating. Thursday: I’m glad Terri didn’t follow through on her idea of making me wear the vest on the hike. I might have mutinied. Friday: I am eating a ton. I haven’t been hungry once all week. Mark and Jon are feeding me huge amounts of vegetables, fruit, avocado, fish, and eggs. (I’m pescatarian.) On workout days, I get a bit of rice or potatoes to serve as accessible fuel for the following days’ hikes. Some evenings I get a bit of locally made cheese after dinner because I love cheese. (I don’t eat sweets, but guests who do get sorbet or other healthy desserts. And those who don’t want to detox and lose five pounds get the occasional glass of wine.) On Sunday and Monday, I hadn’t been able to finish my meals. Now I’m devouring everything and wondering if I’ll really lose weight. Terri tells me to trust her. So I do. That cheese is really good. Saturday: I take back what I said about the hiking days being easier. Today we go up and down four steep, muddy ridges and across stretches of rocky beach between them. And it’s hot and humid, which Terri says forces your body to work harder—it’s that much harder to get enough oxygen when the air contains so much water. Mark and Jon meet us at the last beach and serve me a fresh coconut (Terri encourages me to eat the meat) and a brunch of my favorite dishes, a shrimp gazpacho and a Portobello with greens. I regret having suggested that I might be up for a light workout in the afternoon, but I go through with it. The gentler exercises and stretching (not to mention Jon’s deep tissue massage) turn out to be the perfect way to wind down. Lesson learned: Keep going. Sunday: Terri shows up with the sun to take my measurements before they take me to the airport: I’ve lost 5 pounds, 2.6 percent body fat, and nearly 3 inches from my waist and each thigh. More importantly, I’ve gained a new appreciation for pushing myself, and even getting angry when that’s what’s needed.